FOXBORO, Mass. 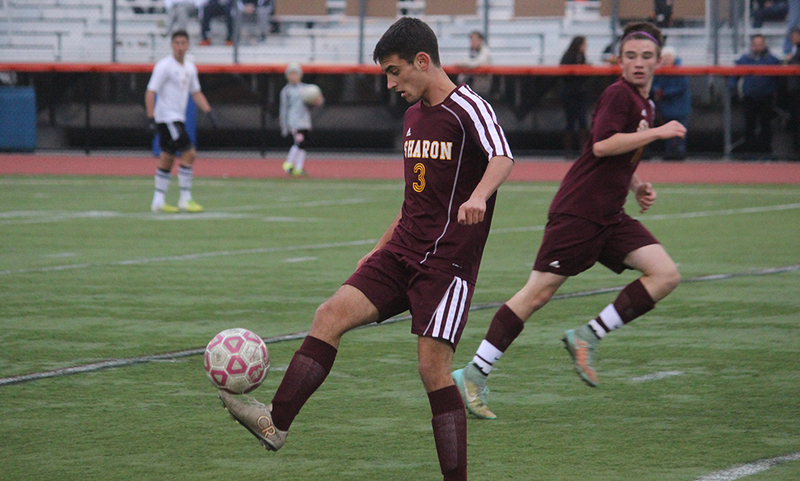 – Sharon dominated the ball for long stretches of the second half of Monday night’s non-league matchup with Shepherd Hill at Gillette Stadium but managed only two shots on target and neither shot troubled the Rams keepers. Frustration mounted on the Sharon sidelines as head coach Bryan Kelly stood with his hands on his head after another attack dwindled away on the sidelines or another free kick failed to make its way into the box. The Rams may not have had the ball much, but they were dangerous when they did get it with rapid counterattacks and long punts into the Sharon box that created several scoring chances, including one in the final seconds of the first half that produced the winner. One mistake at the back, one moment of indecision, was all it took for Shepherd Hill to walk away with a 1-0 victory. The first half was a contrast in styles with Sharon looking to keep the ball down and play through the midfield, which is one of the reasons Kelly moved senior Dan Bender into the back four alongside Sam Weidig. The Rams wanted to move it quickly from front to back and looked for long angled balls into striker Mark Wilding. It only took six minuted for the Rams to show the effectiveness of the strategy when a long pass found Wilding in behind the defense but Andrew Filipkowski got a piece of the shot, which was then cleared off the line. Chances for either team were few and far between. Sharon forced two saves, but both were comfortable ones on shots from distance. On the brink of halftime, the game changed. Ben Boudreau sent a long ball over the top and there was hesitation between the back four as well as Filipkowski. Tyler Fagan took advantage to sneak in and then finish it over the top of the keeper for a 1-0 lead with practically the last kick of the half. 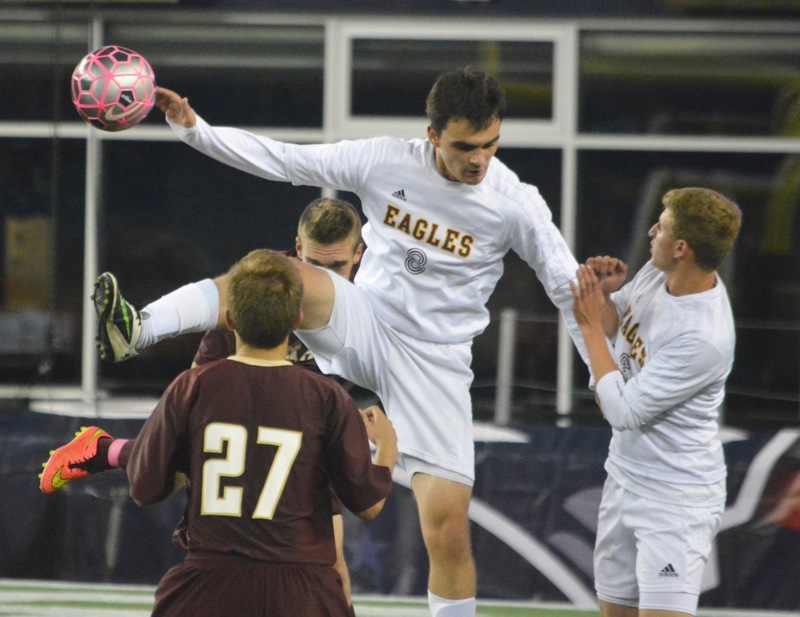 The Eagles came out with renewed vigor in the second half and dominated possession and pushed the Shepherd Hill defense back into its defending third of the pitch. It was there that every attack seemed to break down. The ball would cycle to Sonny Somdah down the left touchline or Lucas Allaria on the right and the ball failed to get into the middle where Kelly argued the Eagles are their most potent. The Eagles kept the ball well with James Dunlea, Matt Lowerre, and Stephen Higgins consistently winning the ball back and getting it back into the attack, but they failed to find openings to take a shot. It was not until the 71st minute off a free kick that Sharon managed to test the keeper in the second half. The best chance of the second half actually fell to the Rams who once again created havoc with a ball over the top of the defense. This time it was Widing that got on the end of it after beating Weidig in the air, but his shot was narrowly over the bar. Despite pushing to the final whistle, Sharon could not find the chance it needed for an equalizer. The Eagles (4-6, 3-5) will return home to face Taunton on Wednesday. SHARON, Mass. 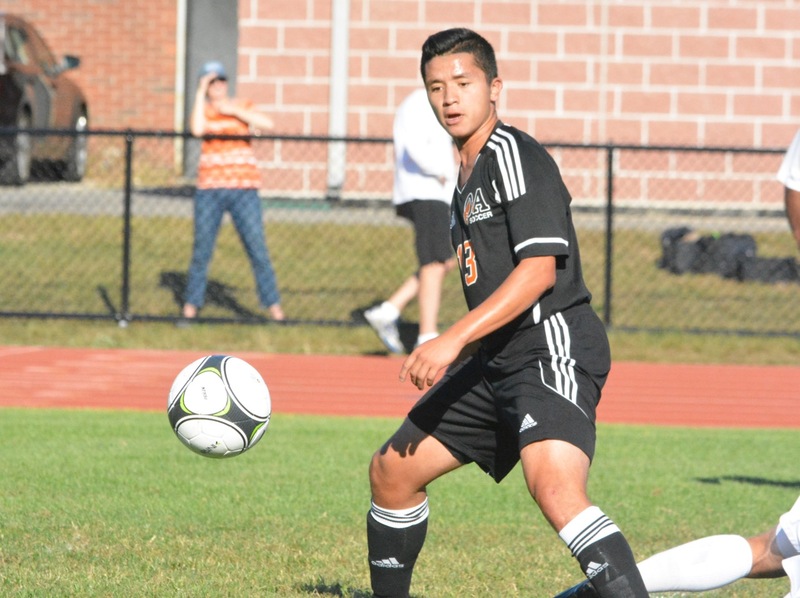 – As Shalin Patel chased the ball over the top in the 38th minute, he had position on Oliver Ames forward Chris Romero and it seemed as though the chance was gone for the Tigers. Then the Sharon right back went to ground, seemingly after having his heel clipped. But the whistle never blew and Romero never hesitated on his path to the ball before coolly finishing it under the bar. The Eagles bench exploded, arguing that it was a clear foul on the defender. The referees came together for a quick conversation at midfield but there was no changing the call and the goal stood. It turned out to be enough for the Tigers for a 1-0 road victory. OA’s record improved to 6-0 and the Tigers have allowed only one goal all season, but in the team talk after the final whistle OA coach John Barata let his team know that there was plenty of room for improvement. Sharon started the game with most of the possession on its familiar grass field. The Tigers were backing off to protect the box and then countered quickly and created a number of good chances in the opening 40 minutes, while the Eagles did not put a shot on target in the first half. The first chance fell to Romero, who was left unmarked in the box and was picked out with a cross by Thomas McCormick but headed wide. McCormick had the next chance off a pass by Keegan Nutt but his shot sailed over the bar. Vella had another chance int he 21st minute. His shot from the edge of the box was spilled by Filipkowski but the Sharon keeper was quick to block the rebound chance by Tylor Jones. Three minutes later, he was off his line quickly again to make a sliding save on Cam Vella. The halftime team talk was crucial for the Eagles and seemed to work as Sharon came out of the break with renewed energy. Midfielders Dan Bender, who missed all of last season with a knee injury, and James Dunlea got the ball into the channels quicker to give Sonny Somdah the chance to run at the OA defense. 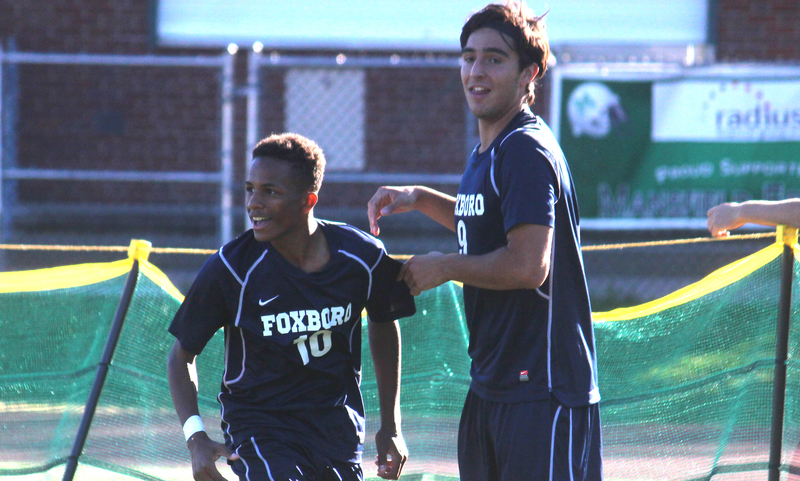 Three minutes into the second half, Somdah created Sharon’s first real scoring chance when he raced to the byline and cut it back to Lucas Allaria, but his shot from six yards went wide. OA managed a pair of chances to double its lead on the counter. Romero quickly played the ball forward to Nutt who found Matt Campbell, but his shot flew over the bar. Romero then took advantage of a misplayed back pass to create space for his left foot but again the shot was narrowly off frame. In the 68th minute, Sharon had its best chance of the game. Somdah was again the player that the opportunity fell to when he ran onto a through ball but OA keeper Jack Carroll came off his line to smother the chance. Two minutes after Carroll’s save, Filipkowski came up with another huge stop when he was down low to his left to stop a shot from Nutt with 10 minutes remaining. It was a sixth straight win for the Tigers to start the season, but Barata admitted that his team had to grind out Thursday’s result. He said, “It’s always wonderful to see these teams go at it and I always tell people that this is good tournament prep. The Hock may not win all the championships but we are ready to go come tournament time because of games like this.